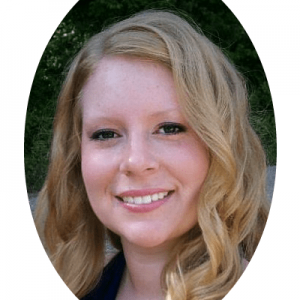 Last week I shared the plan of our mini master bedroom makeover with you. 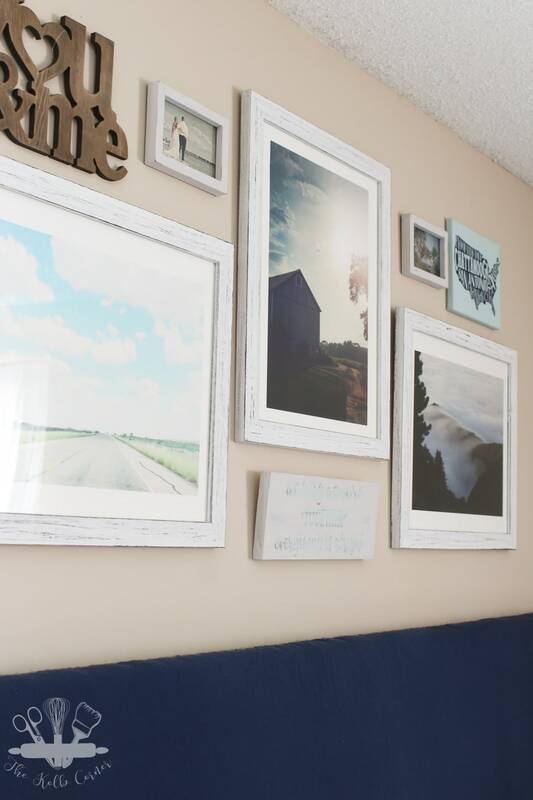 Well, I finished our gallery wall for our room and wanted to share with you some tips on how to create a gallery wall that tells a story. I think any good focal wall needs a story, don’t you? I was approached by Minted a few weeks ago asking if I would like to collaborate on a project. Um, of course I wanted to collaborate! I already had a mini master bedroom makeover plan in my head and knew that Minted’s artwork would make a great focal point! But there was just one problem. Choosing which pieces I wanted in our new bedroom and gallery wall. There are literally thousands of pieces to choose from. My type A personality came out and I knew if I wanted to create a gallery wall that told our story I needed some sort of step by step guide to follow. Well, luckily for you, I’m sharing my step by step guide so you too can create a gallery wall at home! For our mini master bedroom makeover, I wanted to tell a story of my husband and I’s many moves and travels, while having a central theme of “as long as we’re together”. It’s so important to figure out what story you want to tell before you start collecting pieces for your gallery wall. Having a clear path makes the choosing so much easier. 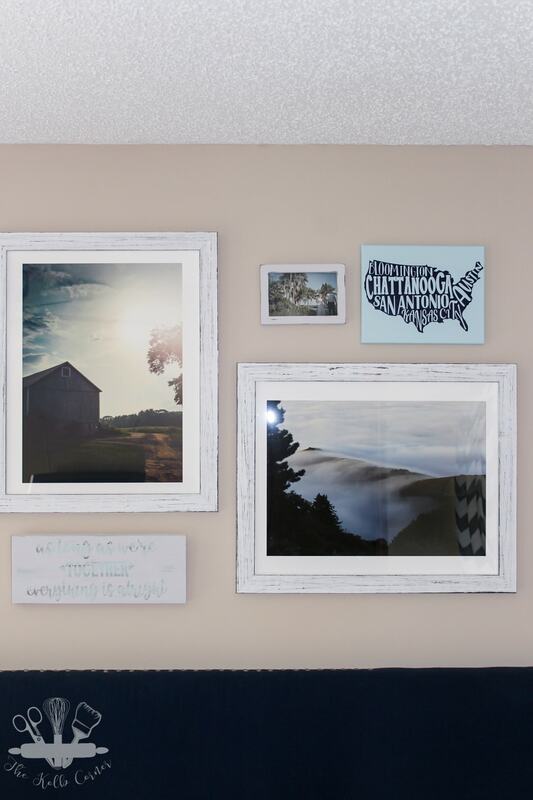 The three large pieces we chose from Minted, each reminds us of various places we have lived. The bright open road really spoke to us and reminded us of the many many country roads we have traveled, whether they were near our home towns, or outside of the big cities we lived in. We have always had a love of the open road and the country. The barn picture sort of reminds us of where we want to be. The barn represents not only our love of being in the country, but also our dream of owning our own homestead. This is a dream we have both had for a long time, and will hopefully become a reality very soon. The mountain and fog was one that spoke to me the most. I remember back before my husband and I married, going on a road trip with him. We drove from Illinois, through Kentucky, Tennessee, North and South Carolina, down to Florida and then back up through Georgia. It was our first road trip, and it was then that we decided to move to Chattanooga. Completely on a whim! We were young, we were adventurous, why not start a new life in a new place? This picture reminds me of a photo I took when we had just crossed the Tennessee line on our way to Knoxville. We stopped at an overlook off of the interstate. It was very early in the morning and so foggy you could only see the fog slightly below you, and the trees on the mountain tops. Anything below was blocked from the fog. I remember being just in awe of the beauty, so when I saw this print from Minted, I knew it had to go in our bedroom. 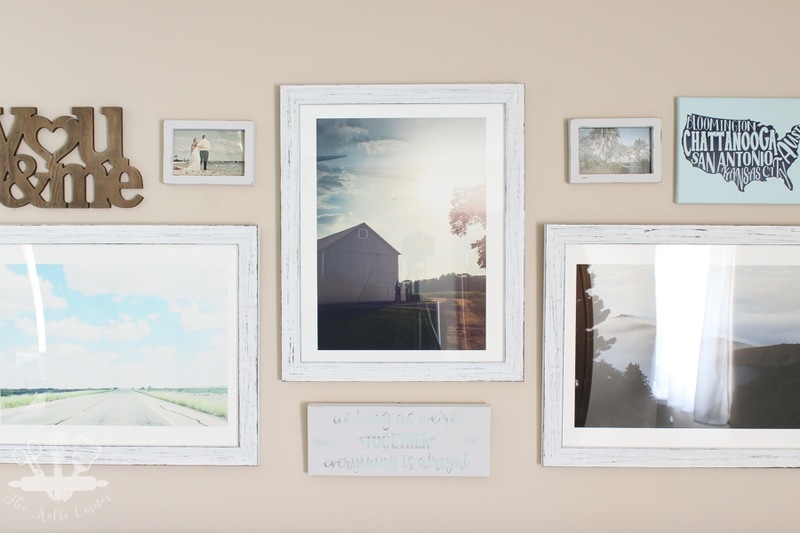 Minted has a HUGE selection of fine art prints, as well as several frame and matting options. Each piece comes shipped in an individual box, carefully wrapped and packaged against damage. You even get a bio on the artist, a brief history behind the piece you selected and a certificate of authenticity. Plus they ship very quickly! I placed my order on a Wednesday and had my artwork by the following Tuesday! 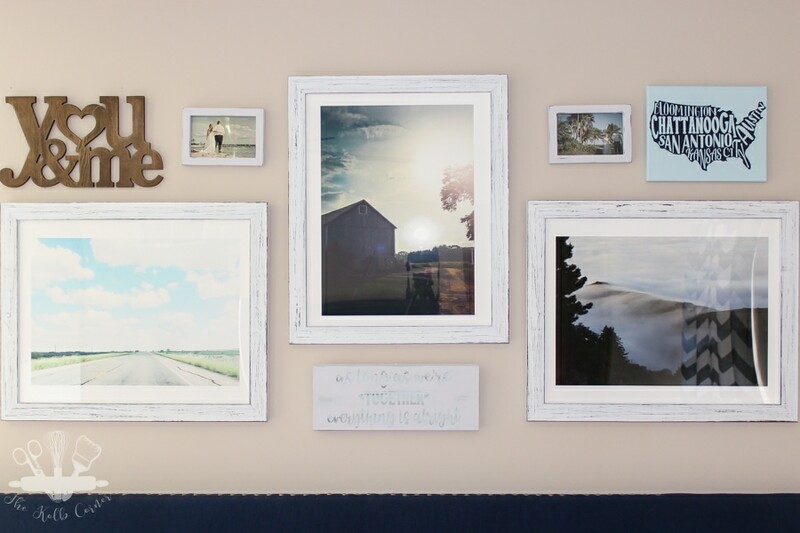 When trying to create a gallery wall, try not to use only photos to tell your story. 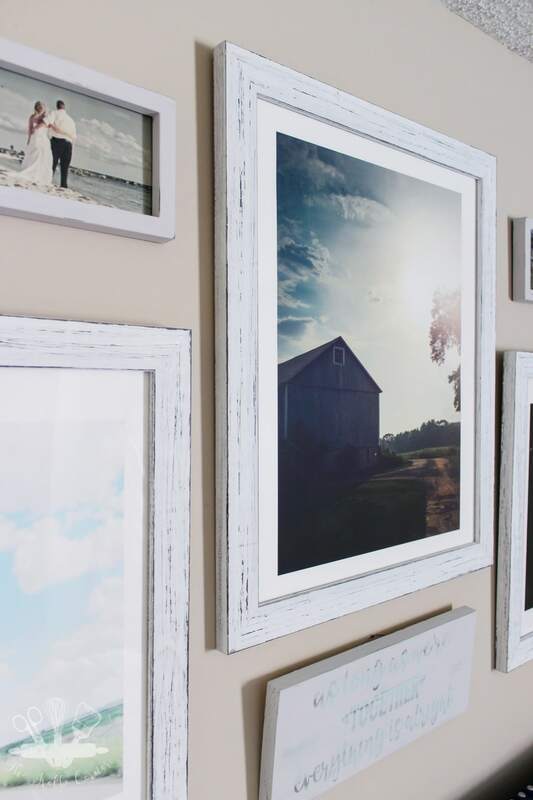 Using a combination of photos, painted canvas and wood really give your gallery wall more depth and interest. Adding in a hand painted sign, or simply some typography art not only helps you tell the story, but lets the eyes travel over the whole gallery wall instead of being focused on one central point. I did several mock layouts before finally deciding on where each piece should hang. The three larger pieces from Minted would be my focal points so I kept those in the center. I am also slightly neurotic when it comes to things being symmetrical, so I needed pieces that were similar in size and visual weight to anchor each side. The best way to figure out the layout you want is to lay each piece out on the floor. Arrange and rearrange until you have the layout you feel works best and tells your story. Then, using sheets of paper, cut out templates that are the size of each piece you are hanging. It’s much easier to tape up those templates to get a feel for how it will look on your wall, than it is to hang up the actual art and realize you hate the layout. Plus it will save your wall from unnecessary holes. What do you think? Does my gallery wall tell our story successfully?? There’s no better place to tell a generational story than a gallery wall of personal photos and cherished artwork. Once you choose your items, it’s easy to put up and rearrange over and over with Picture Hanging products. 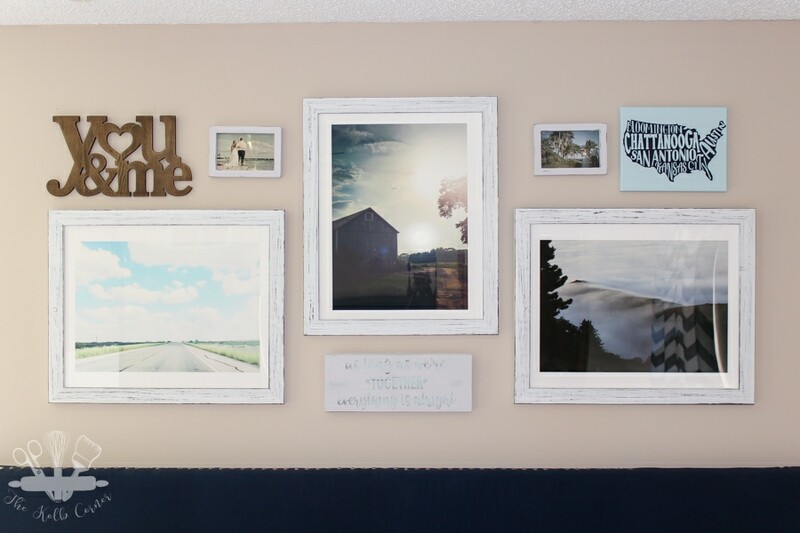 Your gallery wall looks wonderful, and I absolutely love how you chose pieces that tell a story and have a special meaning for you and your husband! Yes, it does tell your story. I love that you created your gallery wall in the bedroom. Such a great idea to practice the layout. You know my favorite piece is the DIY Wall Art Map with all your cities. Thank you Shirley! Next to the minted artwork, that one is my fav too!